Preaching on . . .
Preaching: How to . . .
Indented sections are taken from the original article. Another great interface tool of modern computing is the ContextualMenu. These are hidden menus that popup when a user clicks the mouse while holding down the Control key. Ideally they live up to their name and are actually contextual: that is, they change depending on the user’s current situation. The whole process of adding a ContextualMenu has changed since the original tutorial. Each window and each control have two actions: ConstructContextualMenu and ContextualMenuAction. Each menu item is added to the base parameter of the action function with base.Append. 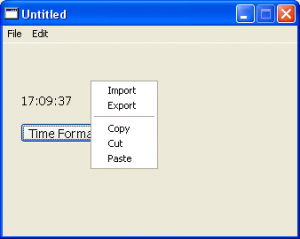 That requires a MenuItem object which takes a string parameter which represents the text displayed on the menu item. The MenuItem.TextSeparator adds a line between sections of a menu. Once the menu items have been added the function needs to return the value true so that the menu will be displayed. In the example we have simply displayed message boxes for each item chosen from the menu, but, of course, any actions desired would be added to each case statement.